BEIJING, July 19 (ChinaMil) -- General Li Zuocheng, commander of the Chinese PLA Army, held talks with General Humberto Oviedo Arriagada, the visiting commander in chief of the Chilean Army, in Beijing on Tuesday morning. Li said that in recent years, the military-to-military relations between China and Chile have experienced further development with the mutual trust and understanding between the two sides being constantly deepened, as evidenced by the closer high-level contacts, smoother institutionalized exchanges and more in-depth cooperation in professional fields. 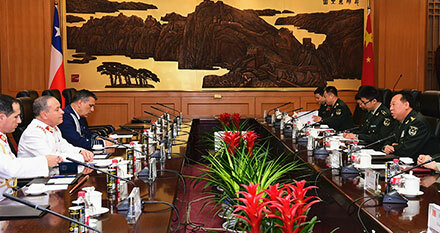 The exchange and cooperation between the Chinese and Chilean Armies are getting closer than ever, Li added. Li hoped the two Armies to strengthen high-level contacts, deepen cooperation in professional fields and expand the scale of exchange between military academies, so as to further promote the friendly and pragmatic cooperation and exchange between the two militaries to a higher level. Oviedo hoped that the two Armies can boost their cooperation in such areas as exchange between military academies, training in professional fields, emergency rescue and disaster relief, military sports, medical assistance and so on, so as to push forward the advancement of relations between the two militaries, especially the two Armies. Before the meeting, Li held a welcoming ceremony for Oviedo and accompanied him to review the guard of honor of the PLA Army.